The Old Foodie: Monroe and Potato. 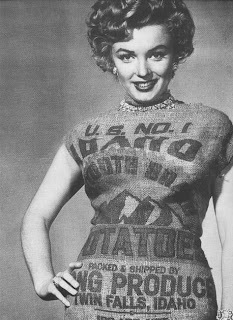 Marilyn (when she was only Norma) may have been Artichoke Queen of 1947, but my friend Peter (who has a bit of a thing for beautiful ladies, especially when they are naked, and to potatoes in any form) pointed me to Marilyn (when she was a Star) dressed in an Idaho potato sack. The famous picture was taken in 1952 as a publicity shot for 20th Century Fox, the idea apparently germinating from the idea that she would look good even in a potato sack. Which she did, of course. There is no evidence that Marilyn had anything else to do with the potato industry, but I cannot post without giving you a recipe. I have chosen again from the Lily Wallace New American Cook Book (1946), to show you that Hashed Browns can be beautiful too, when properly made. Melt 2 tablespoons fat in a frying pan. Add 2 cups finely chopped boiled potatoes, 1 tablespoon chopped parsley, ½ teaspoon salt, and a few grains pepper. Mix thoroughly, then allow the potatoes to brown on the under side. Fold over like an omelet. Serves 6. If you want more potato recipes, please go to the Potato Archive. Well well. Slightly different graphic than usual this morning, Janet. Very nice design and all but it looks terribly itchy. But being Marilyn and all, maybe she had it lined with silk to be comfortable while eating Pommes Souffles interspersed with ever-so-delicate spoonfuls of caviar. None of that for me today. Today it's potato pierogis with lots of browned onions and don't hold the sour cream!